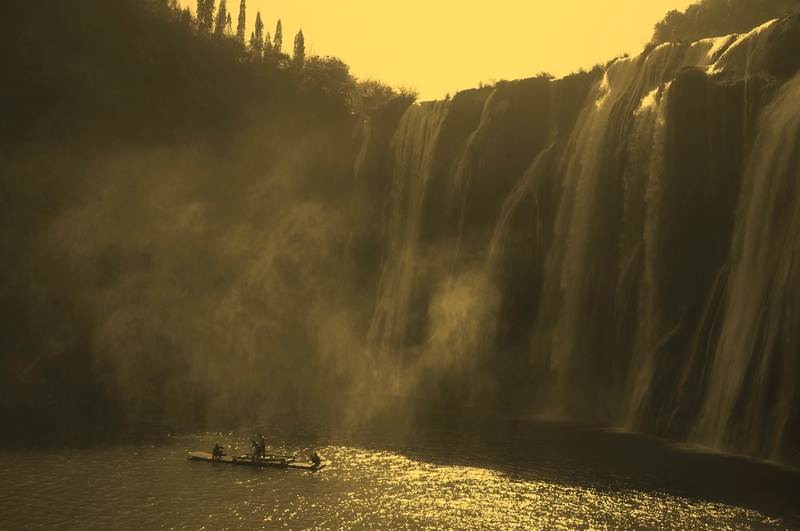 What is it like to take a ride on a bamboo raft, drifting near to a mystical waterfall when the sun was setting. Earlier this year, we took a trip to Yunnan and Guizhou. The Jiulong Waterfall was one of the highlights of the trip. We didn’t have the luck of taking a ride on that bamboo raft but felt the whole scene was surreal when taking the photo. . . . . . . . . . . Anything with water, particularly waterfalls, appeals to me. I like the lighting in this photo. so amazing, one can only imagine .. I really wish to ride that bamboo raft right about now!The image looks very beautiful and serene and I find myself captivated by the sight of the water. I am left to wonder are there any creatures that would see me as supper inside or can I let myself sink into imagining I am swimming in there aswell? I hope the people on the raft knew what they were doing. The lighting really enhances the shot. I knew it had to be one of your photos even before I scrolled down. This is so very beautiful! Do you spend a lot of time composing your shots? This is a very stunning shot! Was it very warm in China? Also – is the bamboo raft part of the tourist activity, or is it for other purposes? Have a lovely day and wonderful weekend ahead! What an incredible scene and great photograph! The little boat below the powerful waterfalls. Wow, this is gorgeous! Had I not seen it here, I would have assumed it was a digital painting. Less well known than Niagra and Iguassu falls but just as spectacular! superb photo and the gush of water is simply incredible! The scenery looks like it’s a scene from a post-apocalyptic science-fiction movie. Thanks for sharing this amazing photo! This shot is epic Michael, I love it. The falls look so powerful and are framed against the tiny boat makes the photo. Beautiful image – love the mood created in this photo. This is truly a magical photo. Wonderful picture, as usual! But I’m not so sure I’d want to be on a bamboo raft at that location!!! Very surreal indeed! Thanks for your like for my latest post. Being on that raft so close to the falls must have been an extraordinary experience! Your photo is also extraordinary. Amazing! You see incredible things in your travels. What is the Chinese name of the waterfall? I went to only a few places in Yunnan. Hola,it Veronika from Travel Live Life and I have nominated you for Leibster Blog Award. You can take a look here – http://travellivelife.com/2013/06/22/liebster-blog-award/ . Thank you for your inspirational stories! No wonder you have 247 likes for this photo … amazing. What a magical photo. How can man ever doubt that a powerful, imaginative God created such beauty? As if man could come close to anything created by God. Wooow! This is great !!! Gorgeous light in this photo… Just lovely! Wow, incredible shot, Michael! You truly captured the majestic beauty of the waterfall! thanks for checking out my blog. Your postings look awesome and I look forward to seeing some more of your postings. This waterfall is incredible! Nature’s wonder at it best! Stunningly beautiful image! What’s the Chinese words for jiulong? Is it ninth dragon? The lighting and the mists make this photo so amazing! I love looking at your pictures! Sorry, I got stuck at WOW! Michael thank you for your loving visit with me. A storm is a typhoon? I am grateful that I was allowed to stay with them as a guest. I come from North Rhine-Westphalia. From Oberhausen close to food. Have a nice day and without heat. I hope it will cool down soon estwas you. Very nice Michael. What a lovely place to visit. What a magical photo!!! Thanks for sharing it! Such a beautiful photo – the lighting is magnificent! Once again your eye for beauty is amazing. Thanks for sharing. And for your frequent visits and likes of my little corner of the blog-iverse. I am pleased that I continue to provide my audience with enjoyable work. Take care my friend – and happy travels! I love waterfalls, have been photographing them for years. Thanks for posting. You got both the “golden Hour and Fresh in this one shot. Very Good. Wow. That is a beautiful shot Mic. That really is a stunning photo. You’re telling a bigger picture here, a greater story–majesty and wonder and glorious Creation. I appreciate your eye for such beauty. Thanks, too, for the like on my blog. Great composition and colour! The yellow filter really accentuates the scene. I like the Niagara falls too. Thanks for liking the picture! I especially like how the angle of the sun causes the shadow of the entire western side to be cast on the water. The mist gives you the feeling of how it must sound too. Imagine that, a picture that creates an image of sound. Wow! Thank you for liking 50figment “A Visit WIth Madame Zahara.” That was an especially fun post to write. Cheers Michael! amazing! i wonder how it feels to be in that raft! must be increible! If you follow my blog, you know how much I love water-falls from the smallest to the grandest. I have not actually been up close and personal to see the more beautiful ones, yet hoping to one day. Excellent.I am in search new words to appreciate the photo genius behind this click. Yes. It looks like a movie set. Amazing picture. Coming so close to a waterfall on a raft like that seems like it would be a bit overwhelming. But thrilling. Those are the emotions your picture captured for me. If I was in that raft, think I would have been a little intimidated being so close to the power of the waterfall. Actually, I think that you have to stand back to get a wonderful photo like this. I enjoy “traveling” with you through these pictures. Amazing photography and enjoyable journey. I hope to post more waterfalls photos for sharing. You are welcome to join me in my travels vicariously! Yes, and also the mist generated by the falling water, what a sight! Such an Amazing Planet, with so much beauty to embrace. Great perspective point on that photo. Thank You. I could look at waterfalls all day . . . . . . Captures the essence of an ink painting of the distant past. I must admit it is one of the best photos I have taken. This is a real photo! This is the waterfall at the top of the picture. I suppose it looks even more beautiful when it has more water in the rainy season. I have other posts on this group of waterfalls on my blog if you search.